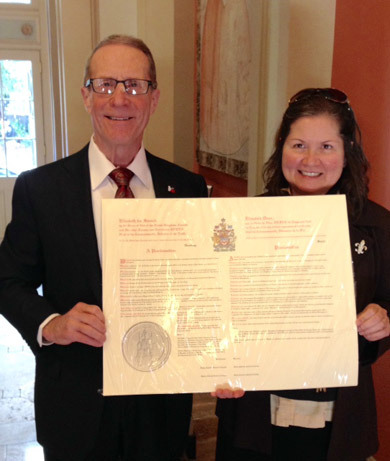 On November 20, 2014, a copy of the Queen's Royal Proclamation was presented to The Historic New Orleans Collection, represented by Viola Berman, in appreciation for use of the facility for the Francophone Section's legal symposium. The original document is in the Canadian Archives. Historically, the proclamation marks the first occasion that the British Crown acknowledged its role in the Acadian Deportation and expresses apologies for the suffering and deaths of thousands of Acadians. Finally, it established July 28 as an annual Day of Commemoration of the event – the same day that the deportation order was signed by the British government in 1755.